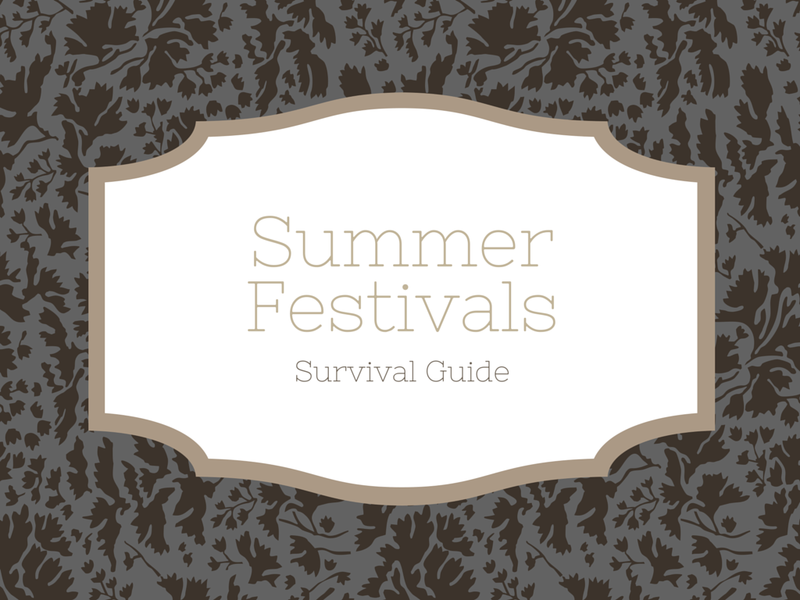 Today I am going to be doing my survival guide/tips on making sure you have the best possible time at summer festivals this year while being safe. I'm not trying to scare anyone from going, I just think it's important to be real about what COULD happen to make sure where possible it doesn't. I saw the below infographic by Pryers Solictors on this blog post by Six out of Ten Mag which perfectly breaks down the main hazards and I will talk a little bit about each one you need to be aware of. There are risks of things such as scaffolding or electrical equipment falling near the stage so while it's great to be at the front from a viewing perspective, make sure you keep your wits about you and I personally would stay clear of the "mosh pit" where people often do a lot of pushing and shoving which is potentially how things get knocked over. These are difficult to steer clear of because they are unexpected and not something you really have any control over. This is one of my absolute pet hates at festivals, when you get a bunch of idiots that start throwing around things like bottles, it's such an inconsiderate thing to do and could really end up hurting someone. Most festivals seem to have banned glass bottles this year which is really positive but still, if you see anyone near you throwing anything move away if you can and alert a steward nearby. This is something really difficult to avoid as being in a crowd is inevitable but try not to be in one alone. Go with a group of friends and make sure you are all looking out for each other and that noone gets seperated or trips over and gets trampled. Also if you are at the front be aware that you run the risk of being forced forward into the stage/barriers as the crowd will naturally move forward towards the entertainment with everyone desperate for a better view. You can really get hurt with things like bruised ribs, I would never go at the front for this reason as personally I don't think the view is worth the risk. Similar to the projectile injuries this is another thing that is unexpected and purely a result of other people behaving badly. If people start dancing erratically or acting violently you need to remove yourself from the situation, move away and make a steward aware. People that do this kind of thing are selfish and ruin other people's festival experience so if festival staff are on the ball they will want to stamp this out as quickly as possible. I cannot even begin to stress how dangerous it is to drive after drinking alcohol and I think doing it is literally intolerable and is putting other people's lives at risk. If you see or know of someone drunk at a festival that is about to drive you need to alert festival staff immediately. 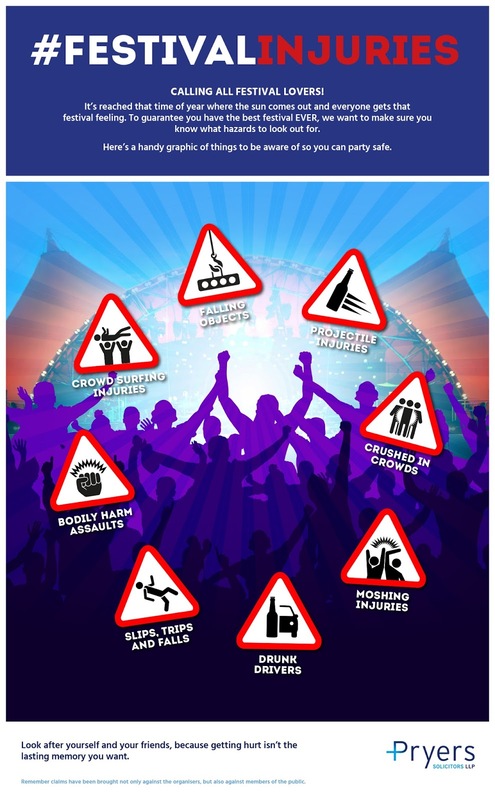 Also keep in mind that even if someone is not acting visibly drunk they may still be over the limit even hours after drinking especially if they have been up late partying so be very alert driving around the area where the festival site is. If you are in a group of friends, try and make an agreement that on the last night the person that will be driving you all home stays under the limit or sober, it's simply not worth the risk. If you want to drink freely then consider travelling via public transport where you will not be in control of a moving vehicle and wont put other road users in danger. Be alert for things like wires, uneven ground and rubbish you can trip over and if it rains make sure your footwear has adequate grip so you don't lose your footing. If you witness or experience this you need to alert festival staff immediately and also the police so it can properly logged and a statement taken. It's completely unacceptable for people to behave violently and it is against the law to assault someone so needs to be taken really seriously. First of all, if you are thinking about doing this, don't. It's as simple as that, why put yourself and other people at risk by doing it when it's completely unnecessary. It's illegal in some countries and a lot of festivals ban it and will remove you from the premises for doing it. I don't really need to point out the dangers but if someone crowd surfs you risk being kicked or hurt whether on purpose or accidentally and if you are crowd surfing yourself you could have clothing ripped or damaged, belongings stolen and of course potentially fall and injure yourself and others. I would say those 7 are the main things to be aware of, it's sad really because if you were to weigh up the risks and dangers it barely seems worth going. You might as well watch the performers from the comfort of your home on TV and get a better view and save some money while you're at it. Saying that the festival atmosphere has a real energy and buzz that you just can't get anywhere else, where everyone is just there to enjoy themselves and the music. It can be a really amazing time, feeling like you are a part of something really awesome and connecting with your favourite artists and fellow fans. I have definitely cut down on the number of festivals I attend nowadays and try and look out for one day festivals closer to home so I can get enough of the experience without going overboard. As I get older I can see myself stopping going altogether, it's already true that I don't enjoy them as much as I did 5 years ago and my tastes have change in terms of music and partying. Are you planning to go to any festivals this year? Let me know below and also any tips you have for staying safe and enjoying yourself. Some important tips included here!! Great post!